The Kyoto Protocol is an international agreement linked to the United Nations Framework Convention on Climate Change. The major feature of the Kyoto Protocol is that it sets binding targets for 37 industrialized countries and the European community for reducing greenhouse gas (GHG) emissions .These reductions amount to an average of five per cent against 1990 levels over the five-year period 2008-2012. It took all of one year for the member countries of the Framework Convention on Climate Change to decide that the Convention had to be augmented by an agreement with stricter demands for reducing greenhouse-gas emissions. The Convention took effect in 1994, and by 1995 governments had begun negotiations on a protocol -- an international agreement linked to the existing treaty, but standing on its own. 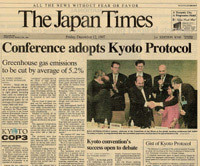 The text of the Kyoto Protocol was adopted unanimously in 1997; it entered into force on 16 February 2005. The Protocol's major feature is that it has mandatory targets on greenhouse-gas emissions for the world's leading economies which have accepted it. These targets range from -8 per cent to +10 per cent of the countries' individual 1990 emissions levels "with a view to reducing their overall emissions of such gases by at least 5 per cent below existing 1990 levels in the commitment period 2008 to 2012." In almost all cases -- even those set at +10 per cent of 1990 levels -- the limits call for significant reductions in currently projected emissions. Future mandatory targets are expected to be established for "commitment periods" after 2012. These are to be negotiated well in advance of the periods concerned. Commitments under the Protocol vary from nation to nation. The overall 5 per cent target for developed countries is to be met through cuts (from 1990 levels) of 8 per cent in the European Union (EU), Switzerland, and most Central and East European states; 6 per cent in Canada; 7 per cent in the United States (although the US has since withdrawn its support for the Protocol); and 6 per cent in Hungary, Japan, and Poland. New Zealand, Russia, and Ukraine are to stabilize their emissions, while Norway may increase emissions by up to 1 per cent, Australia by up to 8 per cent (subsequently withdrew its support for the Protocol), and Iceland by 10 per cent. The EU has made its own internal agrement to meet its 8 per cent target by distributing different rates to its member states. These targets range from a 28 per cent reduction by Luxembourg and 21 per cent cuts by Denmark and Germany to a 25 per cent increase by Greece and a 27 per cent increase by Portugal. The Kyoto Protocol is a complicated agreement that has been slow in coming--there are reasons for this. The Protocol not only has to be an effective against a complicated worldwide problem -- it also has to be politically acceptable. As a result, panels and committees have multiplied to monitor and referee its various programmes, and even after the agreement was approved in 1997, further negotiations were deemed necessary to hammer out instructions on how to "operate" it. These rules, adopted in 2001, are called the "Marrakesh Accords." There is a delicate balance to international treaties. Those appealing enough to gain widespread support often aren't strong enough to solve the problems they focus on. (Because the Framework Convention was judged to have this weakness, despite its many valuable provisions, the Protocol was created to supplement it.) Yet treaties with real "teeth" may have difficulty attracting enough widespread support to be effective. Some mechanisms of the Protocol had enough support that they were set up in advance of the Protocol's entry into force. The Clean Development Mechanism, for example -- through which industrialized countries can partly meet their binding emissions targets through "credits" earned by sponsoring greenhouse-gas-reducing projects in developing countries -- already had an executive board before the Kyoto Protocol entered into force on 16 February 2005.